Kiss star Gene Simmons has insisted that he has no regrets over his controversial attempt to take ownership of the devil horns hand gesture. His bid to register it as a trademark with the US federal copyright office was withdrawn two weeks after it had been filed in June this year. The attempt drew ire from many directions, including from Ronnie James Dio’s widow Wendy, who called it “laughable” and “disgusting,” adding: “It belongs to everyone – it doesn’t belong to anyone.” She’d threatened to sue “on behalf of us all” if the trademark was granted to him. Simmons tells the Windsor Star (via Blabbermouth): “I regret nothing. Wake up every morning and let your conscience be your guide. “Did you know I own the moneybag logo – the dollar sign with the bag of money? I own all kinds of things. I own ‘motion picture’ as a trademark. 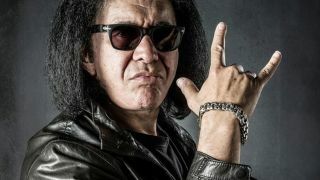 Asked about the trademark bid, Simmons’ bandmate Paul Stanley told Loudwire: “Gene elicits some very strong reactions from people. What he does, he does for reasons that only he knows. It was something he wanted to pursue and the reaction was how people felt about it.